Welcome to the Global Charter Alliance. The Global Charter Alliance is a growing network of carefully-selected, highly-successful, proudly independent charter brokers who share the same exacting business standards and passion for customer service. Working together as a close-knit team, the Global Charter Alliance combines the vast experience, thorough know-how and highly personal service of its individual members . . . with the strong support, enhanced buying power and improved international reach of a multinational player. Uniquely among charter broker organizations, Global Charter Alliance partners fully recognize and respect the vital role of the freight agent and logistics provider as essential links in the supply chain. That’s why Global Charter Alliance members will never by-pass an existing freight forwarder or other intermediary relationship to deal direct with a shipper. 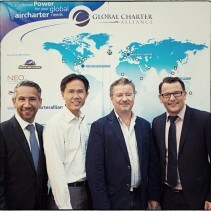 Next time you have an urgent charter need, ask a Global Charter Alliance member to quote. You’ll find the Global Charter Alliance’s members friendly, personalized service and commitment to getting the job done cost no more: in fact, you could save money. And your relationship with your customer will always be safe when you use a Global Charter Alliance member.